BILLOWING CLOUDS OF STEAM rise from the quenching house when a load of burning coke is being quenched. Having been discharged from the ovens, coke is loaded into a long car. Drawn by an electric locomotive, the load of red-hot coke is passed under a tall tower from which deluges of water descend on to the coke. The gasholder on the left stores the gas, which in a steelworks is a by-product of the coke. STEEL, which in the early days of engineering was only sparingly used, is nowadays consumed on such a gigantic scale that it is clear that the methods of its production must have changed from time to time. One of the most recent of such changes is in a direction in which few people would think of looking, that is, in the manufacture of that indispensable fuel - steelworks coke. Domestic coke is not quite the same thing as the coke used in steelworks. Coke is only a by-product of the gasworks, and the gas companies are glad to find a market for this by-product. When coke is made for steel manufacture, gas is the by-product. After certain substances have been recovered from the gas, wasteful burning is sometimes necessary merely to get rid of it. It is to melt the iron ore from which steel is derived that coke is mainly required. In the early days of iron smelting, the fuel used was wood charcoal. Forest after forest went into the furnaces until the district was stripped of wood, and, no adequate means of transport being available to tap distant sources, the industry gradually died out. Sussex is a well-known instance of this, and in several other English counties the same thing happened. Raw coal was then pressed into service in default of charcoal, but it is not a satisfactory fuel for iron smelting because of impurities which it contains. To get rid of these the process of coking is used. The coke produced is suitable for use in blast furnaces which turn the ore into pig iron, as well as for use in other kinds of furnaces used in making steel. 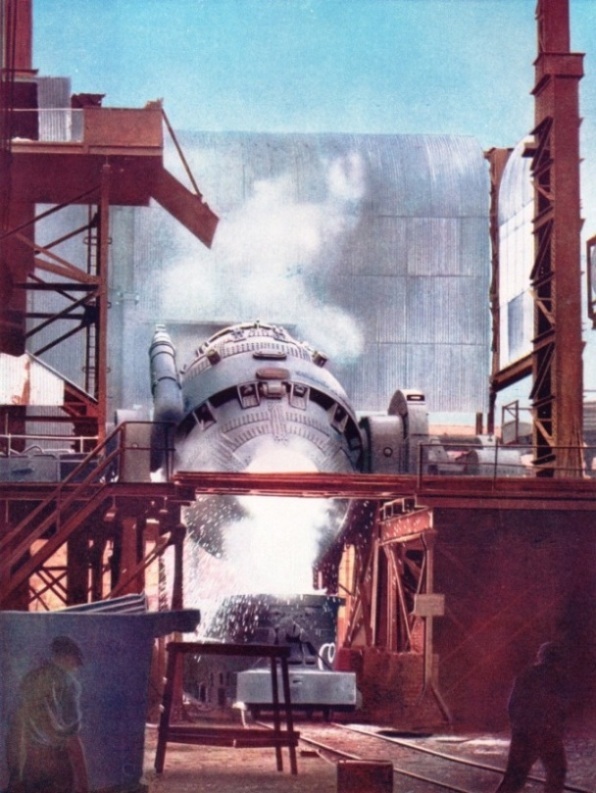 Though not all the pig iron thus produced is turned into steel, some of it being used with little other treatment than remelting, this docs not alter the fact that the blast furnace consumes an enormous amount of coke. It is therefore cheaper to make the coke near the furnaces, and for this reason a battery of coke ovens is generally found at a modern ironworks or steelworks. Metallurgical coke, as it is called to distinguish it from gasworks coke, was formerly all made in circular firebrick chambers in which the coal was partly burnt by limiting the supply of air. These chambers are known as beehive ovens and have almost ceased to be used. The raw coal in present-day practice is sealed up in long, deep and narrow cells, to the outside of which heat is applied, so that the term “oven” can be considered more accurately descriptive of them. The same general principles are used for all coke ovens: as with motor cars and wireless sets, it is the differences in construction that makes each oven distinctive. Four of these types are the Coppee, Simon-Carves, Koppers and Becker ovens, so named after their inventors. The coal is not put into the ovens in the state in which it reaches the house coal cellar. It has generally to be washed to set rid of shale, and it is usually crushed to a small and uniform size. Different supplies may have to be blended. The coal preparation plant of a coke oven battery is often in itself an imposing installation. From it the coal is delivered to a storage bunker. Some of these bunkers hold more than 2,000 tons, the delivery being made on belt conveyers housed in long enclosed galleries. O n the top of the ovens is a long platform, about 200 feet long and 40 feet wide. At one side is a row of vertical pipes resembling the pillars of a colonnade but, except for a pair of widely-spaced rails running lengthwise, the surface of the platform is quite flat. It is, however, marked by four rows of circular covers, sunk flush and resembling the covers of the coal holes often seen in pavements. 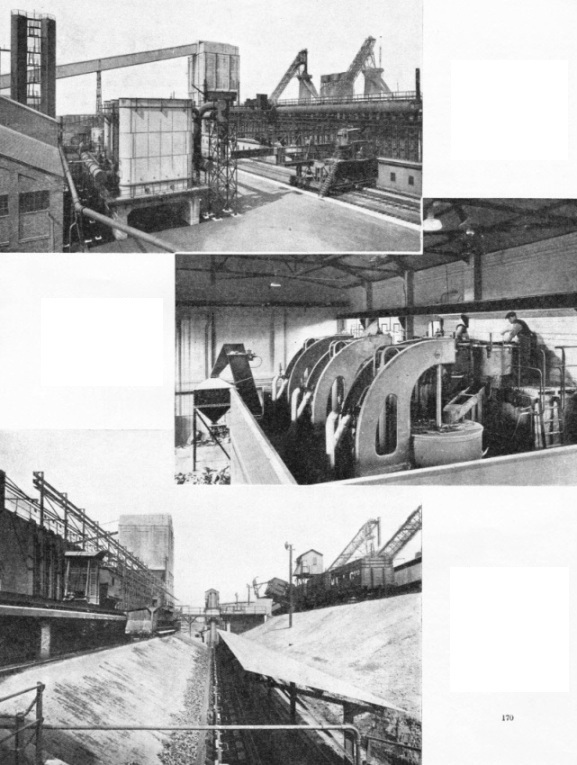 CROSS-SECTION of four coke ovens of the Becker type. The lines and arrows show the direction of the flow of air and gases (as explained in the key) through the flues of the oven battery. The circular inset gives an enlarged diagram of a portion indicated by a circle on the main drawing. Each cross row of four holes (the rows are at intervals of rather more than a yard apart) indicates the position of a coke oven, into the top of which the chutes open. Perhaps there are sixty such rows. On this platform the heat is not unpleasant nor are there any oppressive fumes. Away at one end of the platform and straddling across it, towers the coal bunker building, under which the rails are continued to allow the charging car to be run to take its load of coal, generally about fifteen tons at a time. Before starting on its trip along the platform, the car is weighed and its exact load is automatically indicated by a ticket-printing device. Then the car, electrically driven, glides down the platform to the oven to be charged. The car has four hoppers so spaced that their discharging tubes correspond with the openings of an oven. Through one of the openings can be seen, some 16 feet below, the bottom of the oven and its two brightly glowing firebrick walls about 16 inches apart. The length of this cell may be about 40 feet and its ends are closed by airtight doors lined with firebrick. The discharge tubes having been inserted in the holes, the small coal is then dropped into the oven, being mechanically stirred up in the hoppers to hasten it on its way. The car then moves off and the covers are replaced. On the ground level are the long row of oven doors and, on a lower level. an immense machine known as the “pusher machine”, running on two or more rails. It may be used to operate a kind of rake, passing through a small opening at the door in the oven. This movement levels the coal in the oven, smoothing away the peaks immediately below the charging openings. The rake withdrawn, the opening in the door is plugged and the oven is ready for work. 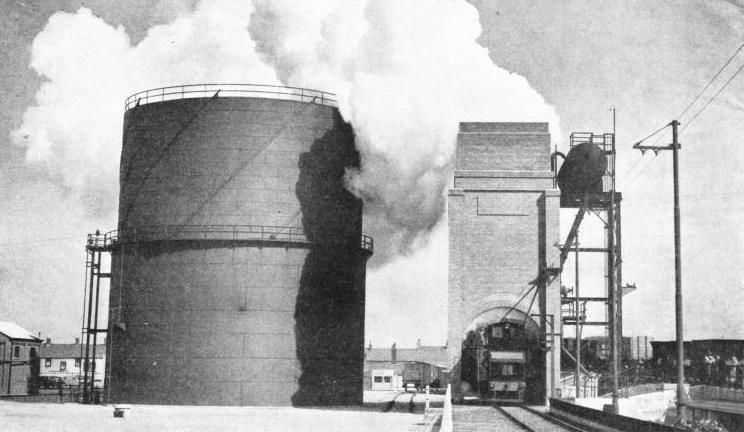 THE BECKER 47-OVENS BATTERY and by-product recovery plant in the Normanby Park Works at Scunthorpe, Lines, was the first in Great Britain to be heated by blast furnace gas. In the centre is the enormous battery with the coal bunker at the farther end. In front are the door-lifting machine and the coke wharf. The quenching house is in the left-hand corner of the photograph. Not all the ovens in a battery are charged or heated simultaneously, but the process as a whole is continuous. Thus the charging of one oven may be going on while the coal in others is in different stages of coking. The heat required to effect the coking is applied to the ovens by burning gas in vertical flues. A series of these flues is arranged between each oven and its neighbour to heat the adjacent sides of the two ovens, with an extra series at cither end of the battery to heat the outside wall of the end oven. The position of the vertical flues is indicated on the battery platform by the rows of little dome-shaped covers which run across between the rows of charging covers. Each of these small covers seals an inspection hole through which conditions in the flue can be ascertained. The gas burned in these vertical flues may be one of two kinds, “rich” or “lean”. The “rich” gas, which is similar to that made in a gasworks, is produced in the ovens as a by-product of the coking process. This gas is first collected up and passed through a series of processes for removal of valuable by-products. It is then passed into a gasholder and from there a proportion (when it is used for heating the ovens) is sent back to the vertical flues. The rest of the gas has unfortunately too often in the past been burnt to get rid of it, but nowadays a great deal is sold to gas companies or to big works in the neighbourhood of the ovens. AT THE BACK OF A COKE OVEN BATTERY are the rails on which the electrically operated pusher machine runs. The long girder is thrust through the oven doors and pushes the coke out the other side. The tanks on the left are the primary coolers for the gas, which is a by-product drawn off the coke ovens. In the background are two of the blast furnaces in which a great part of the coke is used. SULPHATE OF AMMONIA CENTRIFUGES dry the wet crystals of sulphate of ammonia which are formed in one of the by-processes of the manufacture of coke. The crystals are partly dried by being whirled round at an immense speed in these centrifugal machines. The crystals are finally dried in a hot-air chamber and then put into bags for sale. Sulphate of ammonia has a ready sale as a fertilizer. ON THE COKE WHARF, made of sloping brickwork, coke is discharged from the long car which has passed through the quenching house. Barred gates at the bottom of the wharf retain the coke until it is cool enough to be received on the conveyer belt. The conveyer belt moves up into the weigh house at the end of the wharf. In the weigh house the coke is automatically weighed while moving. It is then delivered to the screens for sizing. In a number of instances where coke ovens are situated at steelworks, an important use for this rich surplus gas is to heat forging, reheating and other furnaces round the steelworks. This gas is so suitable for these purposes that some steelworks use all the coke oven gas in this way and heat the coke ovens with the much poorer quality, or “lean” gas inevitably made in smelting the ore in the blast furnaces. Though the blast furnace gas is too low in quality for use in the steel making processes and has therefore often been wasted, the modern coke oven can be adapted to its use. Thus great economies are effected in the cost of steel. It would seem, at first thought, a simple matter to burn gas in vertical flues to heat ovens, but it is here that the efficiency of a coke oven plant is largely established. For the best efficiency the air used in burning the heating gas should be preheated, just as in a motor car the air is preheated by creating a “hot spot” in the air intake to the carburettor. The “hot spot” in a modern coke oven plant is, however, an elaborate affair, although the idea is roughly the same. The heat in the exhaust or burnt gases is used to heat the air coming in. The various arrangements made for this preheating of the air form some of the main differences between one type of oven and another. The general principles are the same in all instances. To understand the Becker system it will be necessary to refer to the drawing above. In this drawing four ovens are diagrammatically shown. The battery platform, with its charging holes, gas pipes and rails, has, for convenience, been omitted, as have also the vertical flues. The positions of the vertical flues are, however, indicated by the vertical lines drawn up the sides of the ovens, these lines having arrowheads, which indicate the direction of flow of the gases and air. Under each series of vertical flues is a pair of long, narrow chambers. These are shown empty in the drawing, for convenience in following the lines of flow; but they are filled with a criss-cross arrangement of firebricks, which allows air or gas to pass through it. These chambers are technically known as “regenerators”, and it is here that the preheating is done. To make clear how it is done, let us consider what happens round the oven on the left-hand side of the drawing. Air enters the bottom of the pair of regenerators under the left-hand series of flues, finds its way up through the firebrick filling, which has been heated up, and, having taken up heat from this filling, flows into the vertical flues through short converging ducts which deliver it through square holes, or “ports”, one of which is formed in the bottom of each vertical flue. These ports are clearly shown in the small circular inset drawing. INTERIOR OF A BENZOL HOUSE. When its ammonia has been extracted from the gas, the benzol left in it is picked up by a heavy oil. This oil is then distilled in the tower seen in the centre and the separated benzol is led off for further refining. The oil is used over again and is circulated by the centrifugal pumps on the right. It will be seen that a third line joins the air-line just above the point of convergence, and that this issues from another square port. This line represents the flow of the coke oven gas used for heating. This has been brought in by a pipe indicated by the small circle shown between the converging ducts. The gas, on joining the air, begins to burn, and the burning gas heats the ovens on either side as it passes up the vertical flues. At the top of these flues the gas, now burnt out, but still extremely hot, is gathered up by a series of horizontal flues, each of which connects the tops of a group of vertical flues, and passes over the top of the oven by a series of semicircular “cross-over” flues, which distribute it by way of other horizontal flues into the vertical flues on the other side. The burnt-out, or “waste” gas travels down the vertical flues on this side and gives up heat to the oven walls on either hand. On reaching the bottom it still, however, retains a considerable heat, and much of this is given up to the brickwork in the regenerators below, through which it now flows out. The air and gases flow in this way for about twenty minutes, and then the whole flow is automatically reversed and air is passed up the right-hand generator instead of the left one, taking up heat from the now hot firebrick filling. Coke oven gas enters by the pipe and square ports on the right instead of the left, and the burnt-out gases pass from right to left through the cross-over flue, down the left-hand flues and out through the left-hand regenerators. Thus, each pair of regenerators is alternately heated up by waste gas and then, on reversal of flow, heats up the air. This gas circulation applies only to the use of coke oven gas for oven heating. 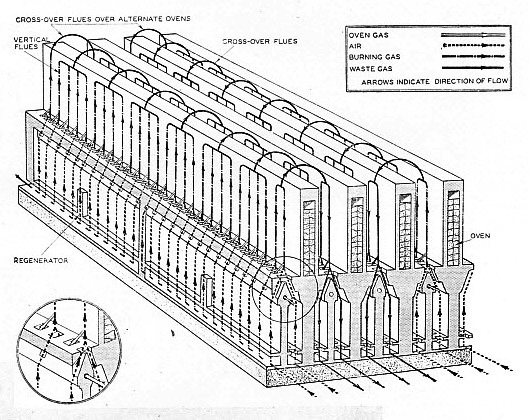 When blast furnace gas is used for this purpose, air will travel up only one generator, and the blast furnace gas, instead of entering by the pipe just below the vertical flues, will pass up the other regenerator on the same side, and the air and gas will join by way of the converging ducts. In this way the blast furnace gas as well as the air will be preheated in the regenerators. Many modern plants are arranged so that either blast furnace gas or coke oven gas may be used at will. Regenerators are used on all ovens of modern type, though the details of their design and their interconnexions vary from one type to another. After having passed down through the regenerators the waste gas enters a large flue common to all ovens, and is drawn out through a tall brick chimney which creates the necessary draught to keep the gases flowing throughout the whole heating system. The means by which the reversal is effected is a striking demonstration of the wonderful manner in which the engineer has tamed natural forces. In the corridor at the bottom of the oven battery is a long row of air and gas valves. These are all connected by a system of links to a single machine in a room at the end of the corridor. This machine is electrically-driven and is controlled by an electric clock, which can be set to cause reversal after any period of time appropriate to the particular coal being treated. THE OVEN DOOR LIFTING MACHINE. 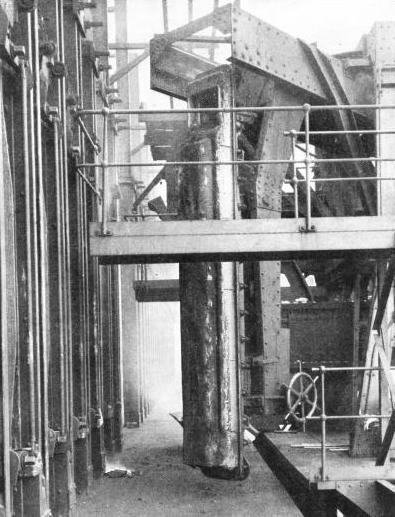 The door is lifted from the oven front by this electrically-operated machine, which runs along the front of the coke oven battery. The same machine replaces the door when the oven is empty and carries a supply of fireclay with which any small leaks are stopped by hand. After the desired interval the flaming, hurrying stream of gas, at the bidding of the tiny instrument, promptly faces round and goes in the other direction, and so back and forth as period succeeds period. No human interference is necessary, though should a hitch occur, such as a gas shortage, a warning siren automatically shrieks to call attention to it. The reversing process ensures even heating of the oven by burning the gas on either side alternately and makes the useful regenerating system possible. When an oven has become ready for discharge, to see how it is emptied one must go round to the “pusher machine”. This is electrically operated and is fitted with an arm which, engaging with the oven door, lifts it out of its fastenings and swings it out of the way. The end of the coke packed in the oven is now visible as a flat glowing surface, but the mass is not, as might be supposed, then dug out piecemeal. The pusher machine carries, in addition to the levelling rake and door-handling arm, a long girder or ram, the end of which has a flat surface slightly smaller than the cross section of the oven. This surface is advanced up to the coke face. The opposite door of the oven has been removed by another handling machine, also electrically operated, and running on rails extending for the whole length of the battery. Immediately under the open door a huge car with a sloping side, with an electric locomotive attached, is waiting. This runs on a set of rails at a lower level. The signal having been given, the ram of the pusher machine is set in motion and from the open door, on the other side of the oven, emerges a red-hot wall of coke. It retains its shape for a foot or two and then collapses in a fiery cascade into the waiting car. Complete discharge is generally effected in about thirty seconds. POURING WHITE HOT STEEL from a Bessemer converter into a ladle for transport to the ingot moulds. The converter is charged with molten pig iron through which air is blown. The air causes the carbon, silicon and other impurities in the iron to burn fiercely so that no fuel is used in the process of conversion. To make pig iron from iron ore, however, large quantities of coke are required and at modern steelworks there is often a battery of ovens continuously at work producing coke from coal. The next step is also spectacular. The glowing coke cannot be allowed to cool naturally as further combustion would take place in the presence of air. It has therefore to be quenched. Thus, immediately it has received its load, the car is run into a tunnel at the base of a tall structure surmounted by a huge water tank. From this tank a flood of water descends on to the coke. An eruption of billowing clouds of steam follows, and then, after a pause to allow the unevaporated water to drain from the mass, the car is run back again to a convenient point at the top of a long, sloping bank of hard brick, called the wharf. A door at the bottom of the car is then opened, allowing the still hot, but not burning, coke to fall on to the wharf. The bottom of the wharf is bounded by a fence of bars which prevents the coke from falling farther and holds it until it cools sufficiently to prevent damage to the conveyer belt by which it is removed. This belt runs behind the fence, which is in sections so mounted that the coke can slide on to the belt wherever desired. The conveyer belt first takes the coke through a weigh house, in which it is automatically weighed while moving. Thence the coke is delivered to the screens for sizing. These screens are virtually large electrically-operated sieves, the size of which varies in different installations. For the most part, however, all the coke above one cubic inch in size separated by the screens goes to the blast furnaces. This may amount to about 95 per cent of the whole, the remaining 5 per cent of small stuff being either sold or else used for heating purposes about the works. The rate of production of a coke oven battery depends on the number of ovens and on their individual size. 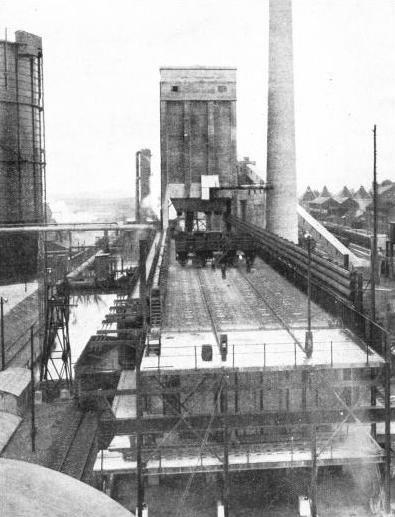 The first installation in Great Britain to be fired by blast, furnace gas has forty-seven ovens of the type described, and is capable of carbonizing, that is, coking, 1,020 tons of coal containing 10 per cent of water in twenty-four hours. This amount of coal produces more than 670 tons of coke. A walk through the by-product recovery part of a coke-oven installation is a surprising experience when one considers that the complexity of pumps, tanks, stills, heaters and pipes are all there for the sole purpose of capturing the same invisible substances as go, unheeded, up the millions of chimneys in Great Britain to foul the town dweller’s lungs, his house and his few trees and flowers. The exact arrangement of a coke oven by-product recovery plant is not invariably laid out to a standard pattern. THE TOP OF A COKE OVEN BATTERY. At the left of the platform are the ascension pipes through which the gas from the ovens is led away to have tar, ammonia naphthalene and benzol extracted from it. The immense coal bunker is seen in the background. In front of the bunker is the charging car from which the coal is run into the ovens below. The charging holes are normally closed by the circular covers seen in rows across the platform. The gas is sucked out of the ovens by pumps known as exhausters. These pumps are now generally of the centrifugal type and, when driven by steam turbines, run at a high speed, sometimes as high as 8,400 revolutions a minute. The pressure of the gas discharge from these pumps forces the gas through the remainder of its journey. The ascension pipes at the top of the ovens are all connected to a large horizontal main, fine sprays of ammonia liquor being introduced at the point of junction for the purpose of trapping some of the tar which would otherwise be deposited in the pipes as it began to cool. 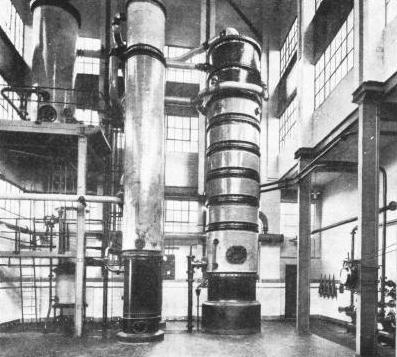 The large main branches off to the primary cooler, a large chamber containing tubes through which cold water is circulated and over the outside of which the gas is drawn by the turbo-exhausters. More of the tar and some of the ammonia in the gas is partly condensed in the cooler and both are drawn off, to be separated in other apparatus. After discharge from the turbo-exhausters there is still some tar to be dealt with. This is in a finely-divided suspended condition - it is “tar fog”. Formerly this tar fog was troublesome to deal with, but science has now solved the problem. In the latest plants the gas is passed through a high-tension electrical field and the tar is almost completely deposited from the fog on to the internal surface of vertical tubes inside the apparatus. Having run down this surface, it is then collected, to be added to the tar already recovered from the cooler and liquor sprays. The tar has a commercial value as material for road making or as a base from which a great number of useful oils, dyes and other products may be extracted. The gas which, leaves the electrical tar extractor has now to be reheated and treated to remove ammonia from it. The exhaust steam from the turbines is often used for the heating process. Having been reheated, the gas is bubbled through hot sulphuric acid. The reaction produces sulphate of ammonia, which commands a good market as a fertilizer. The sulphate of ammonia is a crystalline substance; which is removed from the acid by steam or compressed air ejectors and delivered to machines called centrifuges. These machines have basket-like containers which are whirled round at high speed. Most of the liquid adhering to the crystals flies off under centrifugal force through the interstices of the basket and rejoins that in the reaction chambers or saturators. The crystals are then finally dried in a hot-air chamber, traces of acid remaining on them are neutralized and they are then bagged for sale. The ammonia solution recovered in the primary coolers is distilled and the ammonia driven off rejoins the main gas stream before this reaches the saturators. This stream having left the saturators, passes through a separator which removes any suspended acid. Of its previous contents which it is intended to recover, only benzol remains, with moisture and naphthalene. The naphthalene is extracted by passing the hot gas up a tall tower in which are a number of fine sprays of cold water. These sprays separate the naphthalene from the gas and the whole is drained away for further treatment to extract the naphthalene from the water. Benzol is removed in tower-like structures, sometimes known as benzol scrubbers. The gas is passed over a series of closely-spaced grids over which a heavy oil or creosote trickles. This oil picks up the benzol which, having been removed from the scrubbers, has then to be set free from the oil by a distilling process. The gas on leaving scrubbers is delivered to the gasholders. In ovens provided with regenerators, about one half of the gas may be required for heating the ovens. The other half may be burned under steam boilers or in gas engines, sold for town lighting or burned to waste. 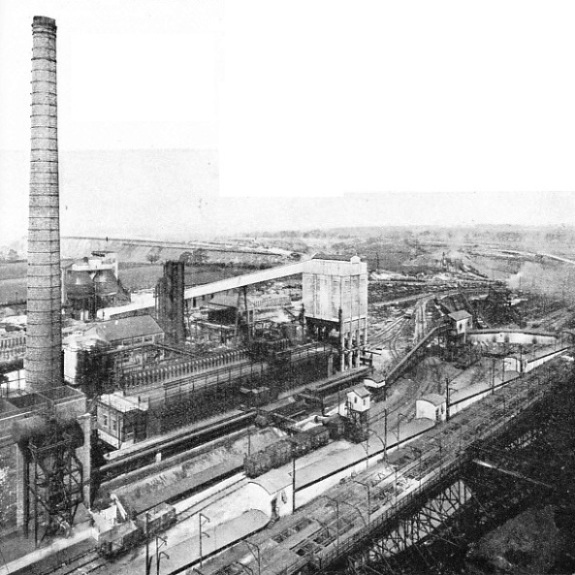 When the conditions are suitable, as in a modern steelworks with various furnaces needing heat and using blast furnace gas for heating the ovens, all the treated gas can be profitably used, and not a pound of coal is required for the multifarious purposes of the works, except that put into the ovens for conversion into coke. RED-HOT COKE is emptied directly from the ovens into a long car, which takes its burning load to the quenching house. 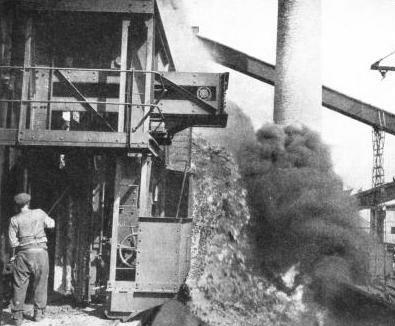 A mechanical pusher operated from the other side of the coke oven thrusts the coke out of the oven. The benzol is still crude when it leaves the scrubbers. It generally undergoes a rectifying process to produce motor spirit, toluol, xylol and solvent naphtha. For these processes other stills, coolers and so forth are required, thus adding to the bewilderment of the ordinary man as he is escorted round the place. You can read more on The Beckton Gas Works on this website.